In our opinion the kitchen is the heart of the home and is increasingly somewhere that is used as the main living space. We feel that it is absolutely critical that any design fulfills the criteria of functionality and form. In other words it will make people stop and stare but will also meet and exceed all the practical requirements of the people using it. We offer a free design consultation. We visit you at home to take measurements or work from your own plans. We will need to discuss, in depth, what you want from your kitchen; how you use or would like to use your space, how many of you there are, whether you enjoy cooking, entertaining, even down to how many you might have at Christmas, including the dog. 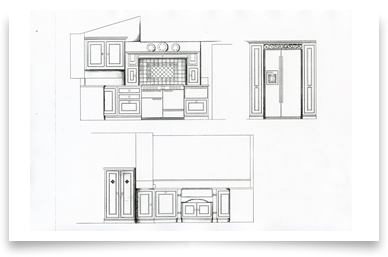 Our plans are still hand drawn as we believe every kitchen scheme deserves a level of attention and thought that can only be achieved when designs are drawn by hand. Our elevations can be hand drawn or produced on a CAD system, to give you a complete 3D view if preferred, and are accompanied by a detailed quotation. We pride ourselves on providing the very best in design and advice that comes only with years of experience and we always keep abreast of new technology so that we can provide our customers with all the information required to make an informed choice. 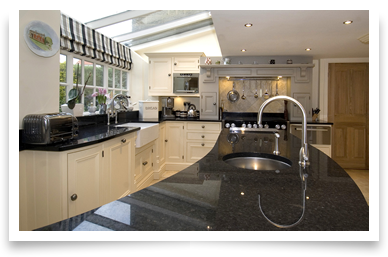 We supply a comprehensive range of appliances, sinks, taps, worksurfaces, flooring and anything else associated with your kitchen project. We provide a complete project management service from initial building work to final decoration and oversee every scheme from start to finish using local, trusted, reliable and certified tradesmen that we are used to working with.